Come hear the thunder ROAR! 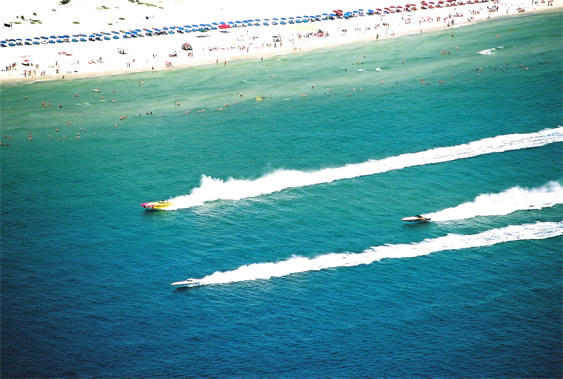 This weekend, October 6-9 the Gulf Coast Powerboat Association will once again present the Offshore Powerboat Association World Championships off the beautiful shores of Orange Beach, Alabama. Racing will take place for four days, with powerboats qualifying Thursday and Saturday and the championship racing taking place on Friday and Sunday. The race course is 6.8 miles on the gorgeous water of the Gulf of Mexico. The OPA World Champions will be crowned at the Awards Ceremony Sunday evening. You can tune into Sunny 107.5 Radio to hear a play-by-play account of the races Friday and Sunday. The race will be steaming live on nobknobgulfshores.com and will also be televised live from Greene County, Miss., to Panama City, UTV Channel 44 out of Mobile on Sunday afternoon. Friday night at 7:30 pm Live Bait will host a meet the race teams event to the public. The State Park Pavilion, otherwise known as Race Village this weekend, will be open to the public daily from 10 am – 8 pm and filled full of excitement. Admission is $5 and Free with VIP passes. Saturday from noon until 4 pm live entertainment can be heard at Race Village with a Boat Parade to follow at 6pm. The parade will leave from the State Park Pavilion and head to Main Street at the Wharf, where it will wind around the Wharf ending in front of the new Orange Beach Event Center. Fans can then take pictures of the boats and get autographs of their favorite racing team. A Gala will take place following the parade in the Event Center featuring the Tip Tops to entertain a roaring crowd, a silent auction, hors d’oeuvres and a cash bar! Limited tickets to the Gala are available for $25. Shuttles will run from the Flora-Bama, Live Bait, Gulf State Park Pier and Lake Shelby. For more information and a list of events go to Thunder on the Gulf. This is fun for the whole family!